This is a huge and nearly complete reenacting kit/impression! Has not been worn to a reenactment, just tried on a couple times at home. Sizes and makers are listed below. Please read list of items CAREFULLY, a couple items in the images are not for sale! The following is included. 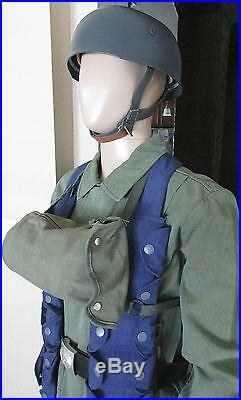 M38 JUMP HELMET (At The Front size 59-60). WOOL M40 CAP (Hessen Antique size 60). 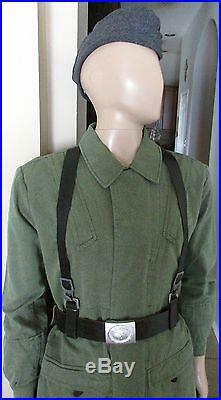 STEP-IN JUMP SMOCK (Hessen Antique size “I” which is about 40 chest). FIELD GREY JUMP PANTS (Hessen Antique size 32-34). 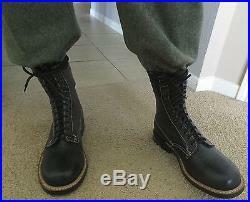 2ND PATTERN JUMP BOOTS (Hessen Antique size 9.5). BLACK LIGHT WEIGHT STRAPS (Frank Barone custom made). 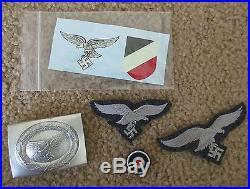 2 STEEL LUFTWAFFE BELT BUCKLES (Hessen Antique). 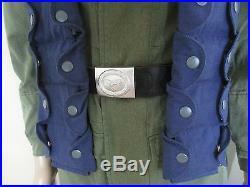 BLUE K98 BANDOLEER (Hiki Shop). FJ GAS MASK BAG (Hessen Antique). SMOCK BREAST EAGLE (Hessen Antique). CAP COCKADE & EAGLE INSIGNIA (Hessen Antique). LUFTWAFFE HELMET DECALS (Hessen Antique). BLACK LEATHER BELT (Origin unknown). BLACK LEATHER MOUNTED BAYONET FROG (Origin unknown). BLUE MESS KIT W/ LEATHER STRAP (Post War Version). 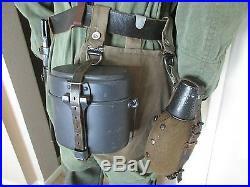 1 LITER CANTEEN SET (Original). NO BAYONET, BREADBAG, or D-RING Y-STRAP ADAPTORS are included in this lot, even though they are shown in the photos! Gas mask bag is filled for display purposes only, no gas mask is included. Mannequin is NOT included. Canteen set is all original, but the leather strap that holds cup to canteen cover has been repaired by a previous owner using a combination of straps, one being dated 1954. All other dates on canteen, cup, and straps are wartime. Any questions please ask. The item “COMPLETE WW2 GERMAN PARATROOPER FALLSCHIRMJAGER UNIFORM HELMET JUMP SMOCK BOOTS” is in sale since Tuesday, August 01, 2017. 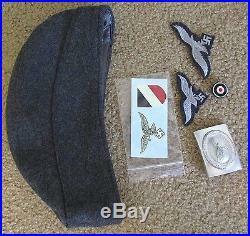 This item is in the category “Collectibles\Militaria\WW II (1939-45)\Reproductions\Germany”. The seller is “frontline_design” and is located in Tomball, Texas. This item can be shipped to United States. 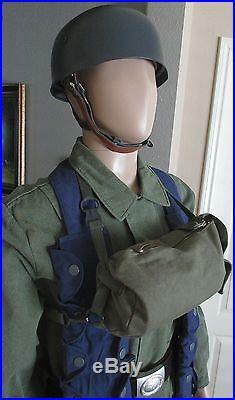 Tags: boots, complete, fallschirmjager, german, helmet, jump, paratrooper, smock, uniform.